When the Democrats nominated William Jennings Bryan as their presidential candidate, The Nation was skeptical. A century ago, Democrats gathered in Denver to choose a presidential candidate to challenge Republican nominee William Howard Taft. 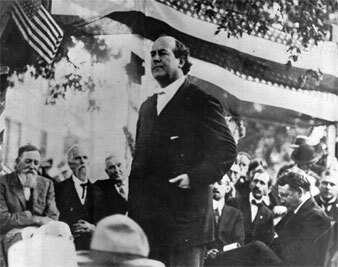 There, the populist William Jennings Bryan accepted his third Democratic nomination in twelve years–and the measured skepticism of The Nation‘s editors. It is a sound piece of advice a French statesman gave when he said that we ought to take political events seriously, but not tragically. In that spirit, Bryan’s third nomination should be received. It is, in any aspect, a momentous thing. No discounting of the occurrence in advance can blind thoughtful men to its significance and its gravity. That this man and what he stands for should have so permeated, so drenched, the Democratic party as to make all opposition futile is not a fact to be lightly dismissed. It testifies to pervasive political conditions which it would be folly to ignore. Bryan is not to be disposed of by calling him a charlatan and adventurer. He has not lifted himself by his own bootstraps. He has been borne aloft by a great wave of discontent and desire for radical changes, which has swept over large parts of the country. That is the serious thing. No one can look through Bryan to the political forces which have made him what he is, and not have some troubled moments. Yet it is no time for treating the matter au tragique. The part of sober citizens is to look about them and see what resources they may count upon in resisting the attempt to turn the government over to a flighty and unstable agitator. No intelligent survey of the nation’s defences against Bryanism can blink the truth that they have been greatly weakened during the past four years. It is not possible today to rally the conservative forces of the country in opposition to Bryan so splendidly as in 1896. Everybody knows the reason why. You cannot revile a man whom you have imitated. A party that has appropriated Bryan’s ideas cannot, with good effect, attack his person. At the very beginning of the Republican campaign, it is the part whether of frankness or sound generalship, to admit that power of resistance to Bryan has been much broken by four years of yielding to him. President Roosevelt’s avowed and deliberate purpose has been to head off, Bryan by stealing his issues. The argument, or threat, which he has constantly used, has been: “If you do not go half way with me, you will have to go the whole way with Bryan.” Well, we see now what comes of the plan of fighting a dangerous enemy by surrendering to him. The Bryan who was to be extinguished is exalted higher than ever. Attempt the comparison between 1896 and 1908, anywhere along the line, and see where you come out. In the former year, Bryan was opposed as being impulsive and voluble, a man who lived upon sensation and would rule by clamor, an agitator who would stir the masses to frenzy by declaiming about the rich and mouthing against corporations. With what face can any Republican repeat those charges this year, after what the leader of his own party has been doing for four years past, amid vast popular acclaim? Turning from personalities to doctrines, we shall similarly find Republican arraignment of Bryan halted by the public memory of what the Republicans themselves have done or attempted. In 1896, Bryan was fought vigorously as one who would lay a rude hand upon the courts. The Bryan platform this year goes much further in that matter than it did twelve years ago. Its ambiguous phrases thinly cloak the purpose to impair the usefulness and validity of the writ of injunction, and to legalize the boycott. But what Republican mouth will not be closed on that subject? There is not a penny’s worth to choose between the two platforms, in that particular; while President Roosevelt’s utterances and wishes in regard to injunctions as brought together in Congressman Littlefield’s cruel review of them, go so far as to give away the whole case against Bryan’s attitude towards the courts. Republicans are loath to admit these things today, but if Bryan were to beat Taft in the election, they would not only admit but assert them. They would say that the triumph of Bryan radicalism had been brought about by Roosevelt radicalism. They would point out how long the President hesitated over the true policy to follow; how he for a time took up the reform of the tariff, but when he found that unpopular, began to appeal to class feeling, to rouse the slumbering passions of the have-nots against the haves, to strike at great wealth in order to win great applause, with the net result of provoking a demand for extreme measures which neither he nor his party could satisfy, and which inured to the benefit of Bryan. If these things would be true after the election, they are true to-day. It is necessary for all who regard, as we do, the election of Mr. Bryan as highly undesirable, to look all the facts in the face, and act upon the situation as it exists, not as we might like to have it. The campaign will be difficult. It is absurd to talk of a walk-over for Taft. He himself makes no secret of his belief that Bryan’s chances of election are better than they have ever been before. The Republicans will know that they have been fighting, before the battle is over. They cannot bring out their old bogeys. The country is not going to be frightened into rejecting Bryan; it may be persuaded. To the task of persuasion, Mr. Taft and his supporters must devote themselves. They cannot hope to outbid Bryan in radicalism: stakes in that coinage he is always ready to double. The real hope must be to conduct a campaign in the interest of quiet and stable government; to meet outcry with reason; so to contrast an experienced and steady candidate with one who is constitutionally erratic, as to convince the voters that the country is safer in the hands of the former.